Happy birthday Julie Andrews Edwards (Mandy). Happy birthday to National Geographic magazine, first published in 1888. It’s Halloween Safety Month. Lots of time to practice before the big day! National Book Month begins as well. During Squirrel Awareness Month, read the Scaredy Squirrel series by Melanie Watt. October happens to be Fire Pup Month. But even old dogs can learn new tricks—and today I will be writing about a cat, not a dog! This year I’ve been meeting with a group of children’s book experts and enthusiasts to choose a small library of the best children’s books. Through this project I have gained an appreciation for authors of books for beginning readers (like the I Can Read series) who can tell a story that children want to go back to again and again. Although a great number of these titles have been published over the years, few have stood the test of time. 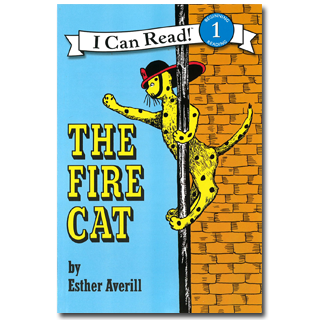 So I am enthusiastic for the book of the day, Esther Averill’s The Fire Cat. First published in 1960, and a book whose fifty-year anniversary went largely unnoticed, The Fire Cat introduces us to Pickles, a yellow cat with black spots. Looking like a feline Dalmatian, Pickles experiences a misspent youth. He chases other cats into trees and drives Mrs. Goodkind to despair. Like her name suggests, she truly wants to help him, and eventually, she calls the fire brigade to rescue him from a tree. The fireman takes Pickles to live in the firehouse. From then on Pickles’s life takes a dramatic change for the better. He learns to slide down a fire pole, go out on missions, and even gets designated a Fire Cat. Now wearing his fire helmet, Pickles makes up for his old bad behavior and helps a young cat get down from a tree. Although the book has been divided into three chapters, in sixty-four pages The Fire Cat contains an entire story, with a beginning, middle, and very satisfying end. The text has been enlivened with animated illustrations of Pickles—either chasing cats or in the firehouse. Combining two favorite subjects of children—cats and trucks—and filled with action, adventure, and humor, The Fire Cat has been one of the favorite first books for children for more than fifty years. Originally posted October 1, 2012. Updated for . Oh, I loved Esther Averill’s cat books when I was learning to read – and still to this day. Unlike many stories with anthropomorphic animals, her cats never lost their essential felineness. As charming as Pickles is, I especially loved Jenny Linsky and her little red scarf. 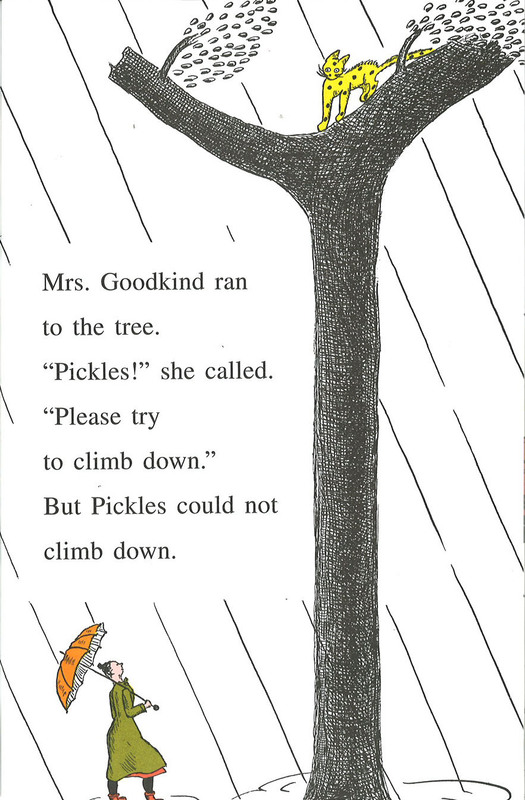 (Don’t fear Pickles’ fans, Pickles makes appearances in Jenny’s stories). I also always loved the illustrations in these books. The black and white with simple touches of colors. So elegant and lovely. An old favorite, this is the first book I REALLY remember reading on my own. I love Pickles the fire cat more than is reasonable. It was a favorite of mine from early childhood (late 70s/early 80s) and is STILL evocative of that time. Thanks for this review – took me right back. I learned to read with this book, and it was one of the first books that my son successfully read to me. In fact, it is so rare to find a Perfect Early Reader, that it’s one of the few books I won’t read to my kids until they can read it themselves. I don’t want to ruin it for them!